Get Out! Nature Walks are volunteer-led regular trips with trained master naturalists and other skilled volunteer leaders. Join us for a well-planned, no cost, guided adventure. Once-per-month on Wednesdays; always free; rain, snow, or shine. Check our detailed schedule (below) for specifics or updates. Our program is jointly offered by both the Chebeague and Cumberland Land Trust and the Royal River Conservation Trust. 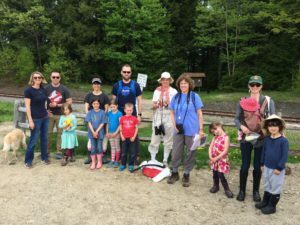 Our nature walks are at preserves in the Towns of Chebeague Island, Cumberland, Yarmouth, North Yarmouth, Pownal, New Gloucester, Durham, or anywhere else we decide to roam. Be mindful of the weather, and dress accordingly. Bring appropriate gear, snacks and a thermos or water bottle. Check back here for any updates or changes. Nature walks typically involve getting on our knees with a hand lens, or standing still for ten minutes craning up at a treetop. Trips are great for kids, but inappropriate for folks under age 6. Our curriculum is targeted at adults and engaged youth. Because the purpose is nature observation, we ask that dogs do not join us. Our program is popular for new residents, neighbors, or folks of all ages who want to get to know our organizations and explore new preserves. Wednesday, May 22, 2019, 1:30 to 3:00pm: Knight’s Pond. GPS Address: 477 Greely Rd. Extention, Cumberland Center, ME. Knight’s Pond is owned and managed primarily by the Towns of Cumberland and North Yarmouth, the 334 acre Knight’s Pond Preserve is popular for ice skating, bird watching, fishing, dog walking, mountain biking, trail running, snowmobiling, hunting and more. For information on birdwatching at Knight’s Pond visit: Best Birding in the Royal River Watershed. This preserve is owned and managed by the town of North Yarmouth and acquired with the financial support of the Royal River Conservation Trust members and donors. Chandler Brook Preserve is a 65-acre property that borders Chandler Brook, one of the major tributaries to the Royal River. 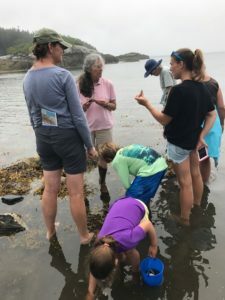 Wednesday July 24, 2019, 7:45am to 12:30pm: CCLT’s Deer Point Chebeague Island ME. This nature walk will be scheduled for a 9:00 am start due to the Chebeague Transportation Companies ferry schedule. Participants will take the bus from the CTC parking lot at 7:45 am and board the 8:15 ferry to the island. Transportation to the trailhead for Deer Point will be provided, and participants will be back to the ferry to depart on the noon boat. Deer Point is privately owned and protected by a conservation easement held by the Cumberland and Chebeague Land Trust. With a strip of gray ledge separating its thatch of dark spruce from the ocean, Deer Point is reminiscent of a typical downeast Maine island. It is a wild place, exposed to the open ocean, and it has been a favorite spot for picnics for generations. Thanks to the generosity of its owner this spot will stay in its wild and scenic condition and be accessible to the public forever. Wednesday August 28, 2019, 1:30 to 3:00pm Old Townhouse Park. Old Townhouse Park is owned and managed by the Town of North Yarmouth. Located off Memorial Highway, the park is comprised of 62 acres of open space in the center of town that includes a 3.1 mile trail network. It’s 25 acres of upland fields along with 30 acres of seasonal flood plain and freshwater wetlands make this a recreational centerpiece for the town. The trails at Old Town House Park meander through wide, open fields, along the Royal River and through some riverside woodlands, and provide primarily easy walking opportunities.